After leading police on a two-mile chase, an Oregon man who stole a delivery van packed with doughnuts pulled the vehicle over and placed his hands out the window as a pastry fell from his grip, according to cops. 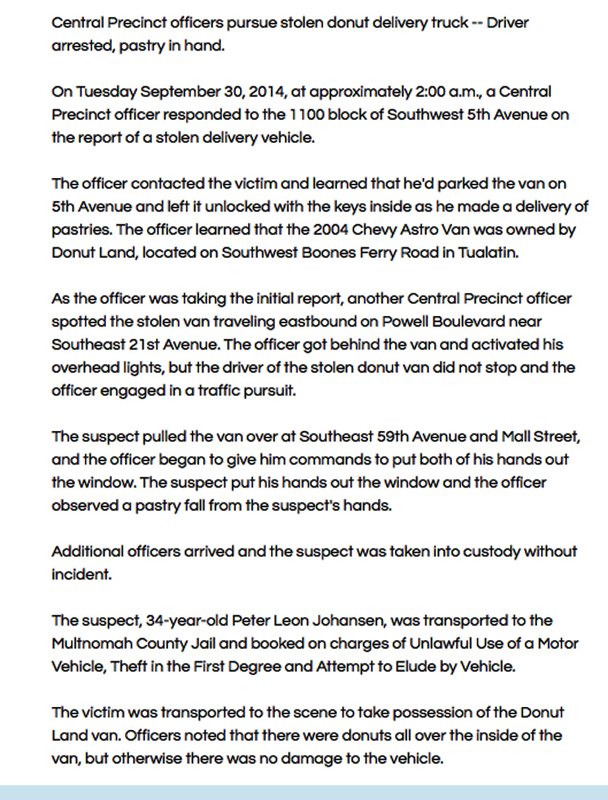 The 2004 Chevrolet Astro van was stolen around 2 AM today when its driver stopped to make a delivery in Portland. The vehicle is owned by Donut Land, a business headquarted in Tualatin, a Portland suburb. Investigators allege that Peter Leon Johansen, 34, got into the unlocked vehicle and drove off. But soon after the van was boosted, a cop spotted the vehicle and gave chase. Johansen eventually pulled over and complied with an officer’s demands to put his hands out the van’s window. “The suspect put his hands out the window and the officer observed a pastry fall from the suspect’s hand,” according to a Portland Police Bureau report. Pictured above, Johansen was arrested and charged with stealing the van and fleeing from police. 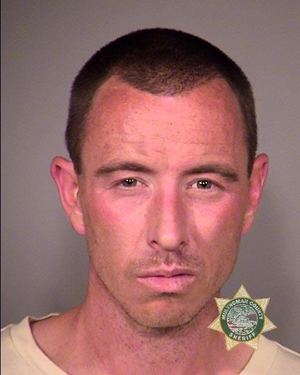 He was booked into the Multnomah County jail, where he is locked up in lieu of $15,000 bail. While the Donut Land vehicle was not damaged during the chase, “there were donuts all over the inside of the van,” investigators noted. It is unlear whether cops had to impound any of the pastries for evidentiary purposes.